While it would be tough for me to weigh in on an internal Catholic issue, I can have a personal opinion overall. The biggest problem I have is that if you believe what you claim to believe, why would you put time and energy into an Organization that actively works against that belief? EMO, clearly and unequivocally, has the position that gays and lesbians are not engaged in unnatural sexual relations, essentially they hold homosexual behavior to be OK. Last time I looked, the Catholic Church still, and rightly so under the bible, believe homosexual behavior to be unnatural and immoral. While many of their programs for social justice are great, the Catholic Church doesn’t need to belong to advance those noble causes they do promote. It is one thing to love and tolerate all sinners, it is quite another to say their sin is ok and free of consequences. By belonging to EMO the Catholic Church is compromising their own values, for what benefit? Whatever benefits they believe come from membership can easily be obtained other ways without giving tacit approval to the homosexual lifestyle. I am all for having a loving and open dialogue with other Christians about our different interpretations of scripture, but why do I have to join their organization? The bottom line is, they have an important belief that runs counter to Church doctrine; and without the Catholic Church, they really represent a very small number of Oregon church goers. So why get involved? RITES A Rite represents an ecclesiastical, or church, tradition about how the sacraments are to be celebrated. Each of the sacraments has at its core an essential nature which must be satisfied for the sacrament to be confected or realized. This essence – of matter, form and intention – derives from the divinely revealed nature of the particular sacrament. It cannot be changed by the Church. Scripture and Sacred Tradition, as interpreted by the Magisterium, tells us what is essential in each of the sacraments (2 Thes. 2:15). CHURCHES A Church is an assembly of the faithful, hierarchically ordered, both in the entire world – the Catholic Church, or in a certain territory – a particular Church. To be a sacrament (a sign) of the Mystical Body of Christ in the world, a Church must have both a head and members (Col. 1:18). 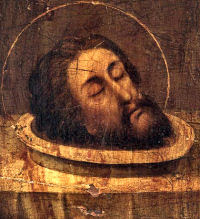 The sacramental sign of Christ the Head is the sacred hierarchy – the bishops, priests and deacons (Eph. 2:19–22). More specifically, it is the local bishop, with his priests and deacons gathered around and assisting him in his office of teaching, sanctifying and governing (Mt. 28:19–20; Titus 1:4–9). The sacramental sign of the Mystical Body is the Christian faithful. Thus the Church of Christ is fully present sacramentaly (by way of a sign) wherever there is a sign of Christ the Head, a bishop and those who assist him, and a sign of Christ's Body, Christian faithful. Each diocese is therefore a particular Church. The Church of Christ is also present sacramentaly in ritual Churches that represent an ecclesiastical tradition of celebrating the sacraments. They are generally organized under a Patriarch, who together with the bishops and other clergy of that ritual Church represent Christ the Head to the people of that tradition. In some cases a Rite is completely coincident with a Church. For example, the Maronite Church with its Patriarch has a Rite not found in any other Church. In other cases, such as the Byzantine Rite, several Churches use the same or a very similar liturgical Rite. For example, the Ukrainian Catholic Church uses the Byzantine Rite, but this Rite is also found in other Catholic Churches, as well as the Eastern Orthodox Churches not in union with Rome. Finally, the Church of Christ is sacramentaly present in the Universal or Catholic Church spread over the entire world. It is identified by the sign of Christ our Rock, the Bishop of Rome, Successor of St. Peter (Mt. 16:18). To be Catholic particular Churches and ritual Churches must be in communion with this Head, just as the other apostles, and the Churches they founded, were in communion with Peter (Gal. 1:18). Through this communion with Peter and his successors the Church becomes a universal sacrament of salvation in all times and places, even to the end of the age (Mt. 28:20). Western Rites and Churches Immediately subject to the Bishop of Rome, the Supreme Pontiff, who exercises his authority over the liturgy through the Congregation for Divine Worship and the Discipline of the Sacraments. The Church of Rome is the Primatial See of the world and one of the five Patriarchal Sees of the early Church (Rome, Constantinople, Alexandria, Antioch and Jerusalem). Founded by St. Peter in 42 AD it was consecrated by the blood of Sts. Peter and Paul during the persecution of Nero (63–67 AD). It has maintained a continual existence since then and is the source of a family of Rites in the West. Considerable scholarship (such as that of Fr. Louis Boyer in Eucharist) suggests the close affinity of the Roman Rite proper with the Jewish prayers of the synagogue, which also accompanied the Temple sacrifices. While the origin of the current Rite, even in the reform of Vatican II, can be traced directly only to the 4th century, these connections point to an ancient apostolic tradition brought to that city that was decidedly Jewish in origin. As a consequence of the Second Vatican Council's Dogmatic Constitution on the Sacred Liturgy, Pope Paul VI undertook a reform of the Mass of the Roman Rite, promulgating a revised rite with the Missal of 1970. This Missal has since been modified twice (1975 and 2002). Mass celebrated in accordance with this missal is the Ordinary Form of the Roman Rite. At the time of the revised Missal's promulgation in 1970 almost all Catholics assumed that the previous rite, that of the Missal of 1962, had been abolished. By decision of the Supreme Pontiff Benedict XVI this general assumption has been declared false and the right of Latin Rite priests to celebrate Mass according to the former missal has been affirmed (Apostolic Letter Summorum Pontificum, 7 July 2007). Mass celebrated in accordance with the Missal of 1962 constitutes the Extraordinary Form of the Roman Rite. – Ordinary Form of the Roman Rite. Mass celebrated in accordance with the Missale Romanum of 1970, promulgated by Pope Paul VI, currently in its third edition (2002). The vernacular editions of this Missal, as well as the rites of the other sacraments, are translated from the Latin typical editions revised after the Second Vatican Council. – Extraordinary Form of the Roman Rite. Mass celebrated in accordance with the Missale Romanum of 1962, promulgated by Blessed Pope John XXIII. The other sacraments are celebrated according to the Roman Ritual in force at the time of the Second Vatican Council. The Extraordinary Form is most notable for being almost entirely in Latin. In addition to institutes which have the faculty to celebrate the Extraordinary Form routinely, such as the Priestly Fraternity of St. Peter and the Institute of Christ the King Sovereign Priest, any Latin Rite priest may now offer the Mass and other sacraments in accordance with norms of Summorum Pontificum. • Carthusian – Rite of the Carthusian Order founded by St. Bruno in 1084. Eastern Rites and Churches The Eastern Catholic Churches have their own hierarchy, system of governance (synods) and general law, the Code of Canons for the Eastern Churches. The Supreme Pontiff exercises his primacy over them through the Congregation for the Eastern Churches. ANTIOCHIAN FAMILY OF LITURGICAL RITES The Church of Antioch in Syria (the ancient Roman Province of Syria) is considered an apostolic See by virtue of having been founded by St. Peter. It was one of the ancient centers of the Church, as the New Testament attests, and is the source of a family of similar Rites using the ancient Syriac language (the Semitic dialect used in Jesus' time and better known as Aramaic). Its Liturgy is attributed to St. James and the Church of Jerusalem. 1. ARMENIAN Considered either its own Rite or an older version of the Byzantine. Its exact form is not used by any other Byzantine Rite. It is composed of Catholics from the first people to convert as a nation, the Armenians (N.E. of Turkey), and who returned to Rome at the time of the Crusades. Patriarch of Cilicia of the Armenians. The liturgical language is classical Armenian. The 350,000 Armenian Catholics are found in Armenia, Syria, Iran, Iraq, Lebanon, Turkey, Egypt, Greece, Ukraine, France, Romania, United States and Argentina. Most Armenians are Orthodox, not in union with Rome. ALEXANDRIAN FAMILY OF LITURGICAL RITES The Church of Alexandria in Egypt was one of the original centers of Christianity, since like Rome and Antioch it had a large Jewish population which was the initial object of apostolic evangelization. Its Liturgy is attributed to St. Mark the Evangelist, and shows the later influence of the Byzantine Liturgy, in addition to its unique elements. 3/25/2016 9:15:00 AM from the Catholic Sentinel. 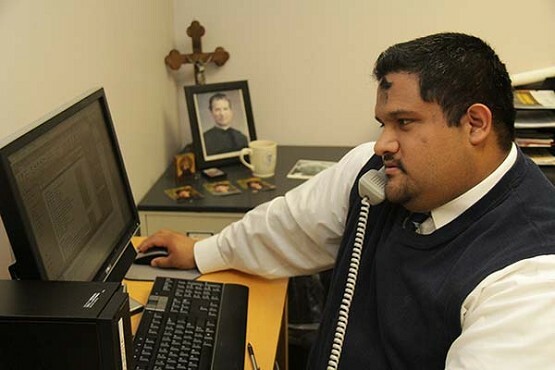 Rolando Moreno works in his office on Ash Wednesday. In the corner is an image of St. John Bosco, patron of youth. Moreno, new director of the Archdiocese of Portland’s Office of Catechesis and Faith Formation, says the focus of teaching the faith should be an encounter with Jesus. The church needs to teach people that Christian belief matters in their everyday existence, says the new director of the Archdiocese of Portland’s Office of Catechesis and Faith Formation. “We have to place a strong emphasis on the encounter with Christ,” explains Rolando Moreno, who took the post in December. “Christ has to be proclaimed as real and that he has a plan for our lives.” Moreno sees catechesis in part as a confrontation of what he calls a “post-Christian worldview” — relativism, uncertainty and self-centeredness. Parents and catechists themselves need to be transformed by the gospel before they can help children move past cultural malaise, he says. It’s crucial for parents to bring their children to Mass from day one, says Moreno, who with wife Angela is a parent of five, including an infant girl born in late February. “It builds a family culture centered on the faith,” he explains. Moreno embraces what Pope Francis said about catechesis in “Joy of the Gospel”: It’s about accompanying people. Moreno received a master’s degree of Theological Studies from the Pontifical John Paul II Institute for Studies on Marriage and Family at the Catholic University of America in 2005. In 2003, he received a bachelor’s degree in theology and philosophy with a concentration in religious education from the Franciscan University of Steubenville. Archbishop Alexander Sample has identified catechesis and faith formation as a top pastoral priority for the Church in western Oregon. Before taking the new role, Moreno worked as pastoral associate in massive St. Joseph Parish in Salem, 2005-2014. Then he taught theology for a year at Central Catholic High School. 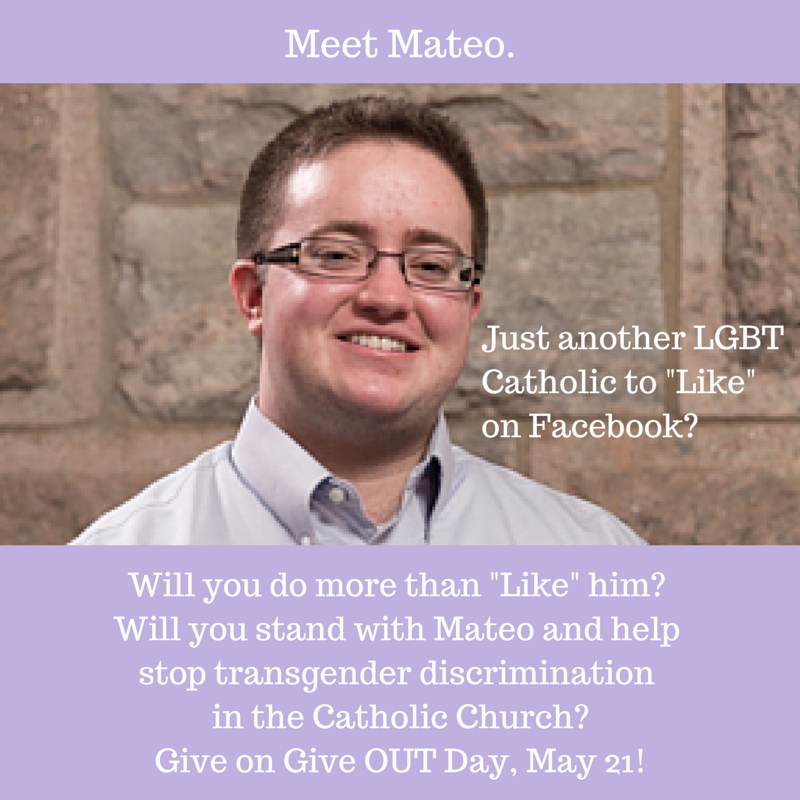 Since 2008, he has been a part-time theology instructor for the Archdiocese of Portland Ministry Formation Program. For Moreno, catechesis in the family and the need to strengthen marriage and families makes up “the most important challenge facing the Church today.” Calling parents “the first witnesses of the Gospel to their children,” he challenges them to live out their baptism and live what they profess. If parents do so, he says, the chances are better that children will, too. He says families need to center their lives on Sunday Mass, Holy Days of obligation and family prayer. Moreno says nine years in the bustling Salem parish taught him about parish ministry among a culturally rich — and diverse — population. The task of reaching different cultures in the church is not something new, he explains. Moreno says experience has taught him that “the human heart is the same across the board.” No matter our heritage, we all have the same need to encounter the infinite, the same need for love, fulfillment, joy and truth. On a practical level, he says, the church does need to respect the particular needs of different communities. Moreno grew up in Michigan in a mostly English-speaking neighborhood. He is not fluent in Spanish, but can converse and understand quite a bit. He promises to continue working on his Spanish. As the Spanish-speaking community of Catholics grows, parishes are short on trained Spanish-language catechists, Moreno says. That’s a problem he’d like to address. Moreno is humbled by his new post and by the trust Archbishop Alexander Sample has placed in him. The new job, he says, has prompted new prayer in him. Celebrating Babies on this very Special Day. The Requiem Mass for our dear friend, Fr. Robert Palladino, will be celebrated in St. Mary's Cathedral of the Immaculate Conception on Friday, March 11, at 11 am. Although his sudden death came as a shock, we are grateful that years ago he had given Dean Applegate instructions for the music he wanted sung by Cantores in Ecclesia. In his beautifully calligraphed hand, he indicated the readings, plainsong and motets he had chosen for his funeral, when that time came. Sadly, that day arrived far too soon for us all. Fr. Palladino died in his home on Friday, February 26. We will always be indebted to him for his decades of support, encouragement and friendship. To say he will be greatly missed only understates our loss. St. Mary's Cathedral is located at 17th and NW Davis in Portland. The above picture of Fr. Palladino was published as part of a substantial and deeply deserved tribute to him in The New York Times on March 4 (online), and in the print version of the paper on March 6. To read this tribute in full, please click HERE. VOCAL helped the gender terms of Patti, born male and Mateo, born female in this article. Another note of interest, during this workshop there was apparently no one giving the Church's side of transgenderism. Mr. FitzMaurice who is a homosexual, organized this workshop. 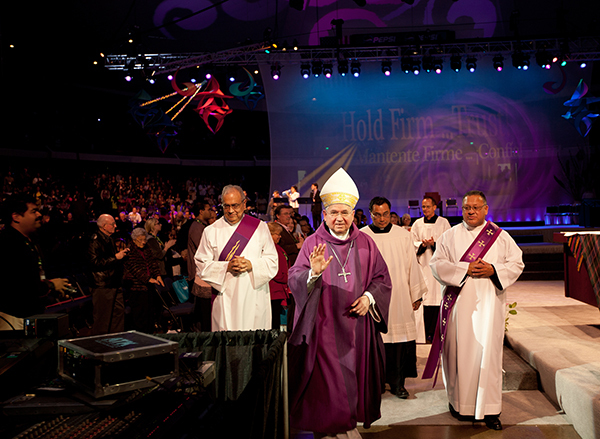 LOS ANGELES – Tens of thousands of Catholics descend on Los Angeles each winter to sharpen their ministry skills, partaking in dozens of workshops and seminars about liturgy, prayer, Bible, and parish life as part of the LA Religious Education Congress. With close to 40,000 participants, it’s the largest annual gathering of Catholics in North America, a celebration of all things Catholic. But event organizers this year took a cue from popular culture and included a new session, one that attracted a standing room only crowd of 750 people, nearly all of whom jumped to their feet for a sustained round of applause after talks from two young, committed Catholics. The Rev. 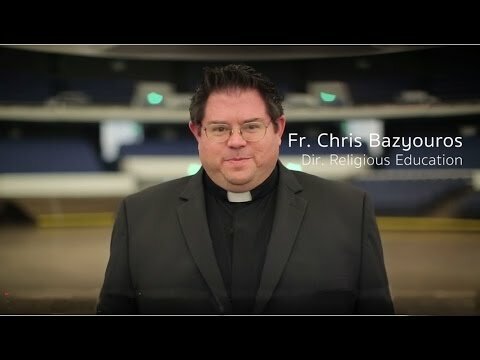 Christopher Bazyouros, the director of the office of religious education for the Archdiocese of Los Angeles, said including the discussion in the program was an important first step for the Church in grappling with an issue that exploded onto the national consciousness last June when Caitlyn Jenner appeared on the cover of Vanity Fair, announcing to the world that she is transgender. To that end, conference organizers invited two transgender Catholics to speak, both of whom were surprised and gratified that they were included. And both used their presentations to urge acceptance by the wider universe of Catholics. Anna Patti (born male), a 23-year-old Michigan resident, told the crowd she didn’t believe “God made a mistake” with her, as some have said of transgender people. “It was beautiful,” she said of the crowd’s reaction. Mateo Williamson (born female), a 24-year-old medical student at the Jesuit-run Loyola Medical School in Chicago, described with joy his deeply Catholic upbringing, part of a family that included several priests and nuns. After his talk, he said many young people thanked him for sharing his story about living as a transgender man in the Church. Pope Francis has spoken out repeatedly against so-called gender ideology, but Patti said she doesn’t interpret those comments as hostile to trans people. In fact, she thinks the pope’s remarks about gender not being just a social construct actually support the transgender community by pointing out that gender identity is innate. The LA Congress workshop sold out quickly, and some of the audience, which included several priests, seminarians, and nuns, said the fact it happened at all gave them hope about the future of the Church. Arthur FitzMaurice, who speaks frequently about LGBT issues in the Church and who organized the workshop, said he believes it was the largest discussion devoted to transgender issues and Catholicism in the Church’s history. He said that organizers have already asked him to plan a similar workshop next year. Catholic Archdiocese of St. Louis Disbands Girl Scouts For Doing What CRS *Actually* Does - Could other Dioceses Follow? *VOCAL is a member of Reform CCHD Now which is now part of the Lepanto Institute. "For months, Catholic Relief Services have been playing the role of the wizard in The Wizard of Oz: nothing to see behind the curtain! Pay no attention! What’s interesting about this is that according to a list of grants dispensed by Catholic Relief Services (CRS) for fiscal year 2014, CRS gave nearly half-a-million dollars to Oxfam. We are currently analyzing the latest list of CRS grants for fiscal year 2014, but on average, between 86% and 90% of CRS’s grants to domestic organizations go to agencies that are acting in direct conflict with Catholic moral and social teaching. 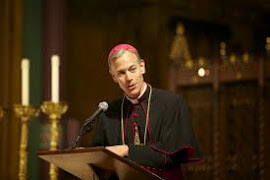 To date, Catholic Relief Services has responded with "internal investigations" -- intimating that Catholic organizations investigating their practices are involved in "slander" and are "maliciously" raising questions as to why CRS is giving hundreds of thousands of dollars to an organization that is now condemned by at least one Catholic bishop. CRS is clearly and deliberately intimidating the Lepanto Institute and other Catholic laypersons, religious, priests and bishops in order to silence any analysis of their anti-Catholic and prejudicial giving processes. CLICK HERE TO READ MORE ON OXFAM AND WHY CATHOLICS NEED TO SPEAK UP. To date, CRS has been very happy to attack and destroy anyone who even dares raise the question as to why Catholic donations are going to unCatholic organizations. Now that the Archdiocese of St. Louis has marked OxFam as one of the bad guys, will CRS finally end the marketing campaign and threats of intimidation? Or will they simply ramp it up? We suspect CRS will simply double down on the attacks. Which is why I am writing to you today: to please send us your maximum possible contribution so we can end once and for all the deceptive funding practices at Catholic Relief Services! 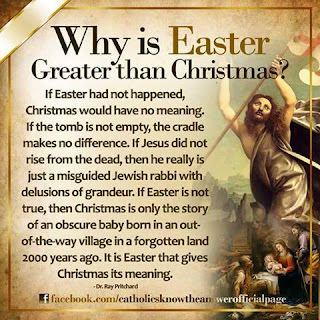 For some time, the Lepanto Institute has made it our mission to bring these facts to light, in service to our priests and bishops, in order to restore Catholic sanity and fulfill our Catholic mission -- to "restore all things in Christ" for the salvation of souls. Millions of Catholics who faithfully work for and in service to Holy Mother Church are being deceived by a coterie of well-heeled bureaucrats willing to compromise what you and I believe as Catholics. But when our donations and charity are used to fuel the fires of the culture of death, that is WRONG. Without your gift of $35 or more, these facts might never come to light. Our bishops and priests might very well be kept in the dark by these professional bureaucrats, and faithful Catholics every Sunday would give in charity to support things such as contraceptives, abortifacients, or worse when they believe they are feeding the poor, helping families, or building up the Catholic Faith. It's time we -- as Catholics -- stood up with a clear voice and give our priests and bishops the support they need to investigate "institutionalized Catholicism" at places such as Catholic Relief Services -- organizations that serve themselves, but hedge on our Catholic faith. That's the reason why the Lepanto Institute exists, to warn our priests and bishops and remain true to the teachings of the Holy Catholic Church. It has been said that the solution for what ails the Catholic Church isn't diversity or community or dissent... but one word: FIDELITY. If you believe as I do that the universal call to holiness is not a mere abstraction, but something our Blessed Mother desires most ardently for the souls of mankind, then I need your help -- and I need to show your support so we can continue to take on the enemies of Mother Church and keep the attention up and focused. 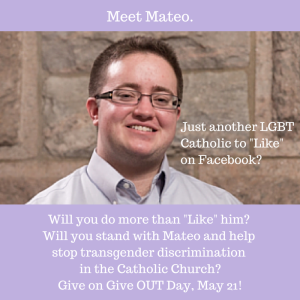 For one, I am so glad to see that the Archidiocese of St. Louis took this step! We need to continue to show support for our priests and bishops who take courageous stands such as these in the face of the intimidation tactics, threats, and lies that are so often used to promote evil. Can I count on your support for $35 or more today? PS: REMEMBER that nothing we do here at the Lepanto Institute is done without the prayers and support of faithful Catholics such as yourself. Bringing this information to light is hard -- we know it's hard to see -- but unless it is done, more victims of this senseless and outrageous pattern of deception will emerge. Such deception is dangerous to our faith, our priests, and to Holy Mother Church, and we here at the Lepanto Institute remain dedicated to prayerfully and faithfully raising the tough questions -- all in faithful service to our bishops and priests. Christus vincit! Christus regnat! Christus imperat!